Here are just a few of the reasons why you should invest in a birdcage cover. 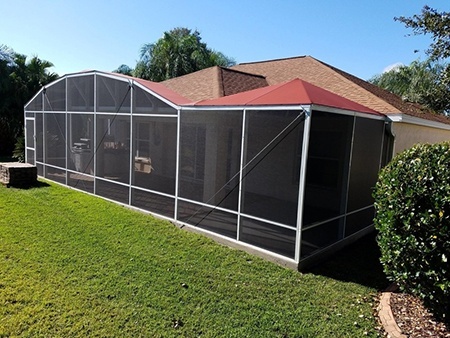 They provide shade without restricting airflow - because Canvas Birdcage Covers only go over the top of your pool screen enclosure, you can enjoy unrestricted airflow with plenty of shade. This takes away the inconvenience of only enjoying your screen enclosure after the sun goes down and protects you from the sun’s harmful UV rays. They provide rain protection - sitting outside enjoying the sound of falling rain is relaxing. Canvas Birdcage Covers are durable and weather resistant. They keep you dry while you enjoy the sights and sounds of a Florida rain shower. They blend in perfectly - These canvas covers come in a wide variety of colors, styles, and patterns to perfectly complement your home's existing color scheme. For residents of communities with HOAs, canvas birdcage covers conform to the rules of most HOAs in Lake & Sumter Counties, including The Villages. They withstand heavy winds - Canvas Birdcage Covers are built to withstand winds more than 110 mph. They are firmly secured to the metal frame, following applicable county, state and federal regulations. This means that even in Florida’s tropical season, your screen room is protected. They are low maintenance and Durable - Because Canvas Birdcage Covers are made from material that withstands weather without restricting air flow, they are resistant to mold and mildew. Just remember that Quality Screens and Aluminum can handle all of the birdcage screen needs. Call us today at (352) 326-9090.